The cycle of sleep and wakefulness is an everyday human experience; but in Parsifal the need for sleep and the need to awaken out of sleep (into consciousness) bears a special significance. The same could be said of an earlier work by the same composer; his Siegfried, in which the central characters of Siegfried and Brünnhilde, as individuals, develop and awaken. In Parsifal, it is the eponymous hero and his would-be seducer, Kundry, who undergo personality changes. In Parsifal's case those changes are linear while for Kundry the changes are cyclical. he music-drama Siegfried, which is the third part of Wagner's Ring cycle, is a drama about sleep and waking. At the beginning of this drama, it is the dragon Fafnir who sleeps, coiled around the Nibelung hoard. It is the young hero Siegfried, we discover, who is to awaken the dragon, and in the process Siegfried takes important steps in his own development as an individual, which can be likened to an awakening. In the second act of the drama, we see the dwarf Alberich awaken from sleep by the dragon's lair; soon dark Alberich is joined by the god Wotan, and together they waken the dragon, to warn him of the approach of young Siegfried. Fafnir turns over and goes back to sleep, only to receive a rude awakening from the hero. After he has killed the dragon, Siegfried tastes the blood, and as a result he gains the ability to understand the meaning of bird song. A little bird leads him to the Valkyrie rock, where he awakens the sleeping Brünnhilde. At first he confuses her with his mother (as Parsifal at first will interpret Kundry) but the "mother" becomes his lover. Although she is awake in a literal sense, Brünnhilde does not seem to have woken up to an awareness of her new situation as a mortal woman; it is only after Siegfried calls on her to wake up, that Brünnhilde awakens to her new life. he mother is a symbol of the unconscious, Tristan's weiten Reich der Welten Nacht . Wagner's heroes often are preoccupied with their relationships to their mothers: Tristan is full of guilt at causing the death of his mother when he was born ( sie sterbend mich gebar ), Siegfried never knew his mother, and Parsifal learns that he too was the cause of his mother's death. The woman who appears and reminds the hero of his mother (in the case of Brünnhilde unintentionally, in the case of Kundry by design) is in Jungian terms an anima figure. he sleeping valkyrie was not invented by Wagner, of course. She is recognisably the fairytale figure of Sleeping Beauty (Dornröschen); like many other fairytales, as the Grimm brothers discovered, her story could be traced back to an early Germanic original, surviving in the form of Old Norse poems and sagas. The sleeping beauty was originally (in Sigrdrífomál in the Poetic Edda) called Sigrdrifr. This character was merged with Brynhild, not by Wagner, but (most likely) by the author of the Volsungasaga, an important source used by Wagner in his Ring. (Confusingly, there is another Eddic poem, Helreið Brynhildar, in which the once sleeping valkyrie is called Brynhild, but this poem was probably composed after Volsungasaga). Brynhild was put to sleep with a thorn and woken by Sigurd removing her armour; Wagner's Brünnhilde (whose name is the Germanised form of Brynhild) is both put to sleep with a kiss (from Wotan) and woken with a kiss (from Siegfried). the end of the final opera in the cycle, Wagner's Brünnhilde undergoes a further change. She reaches a level of awareness in which she is able to understand all that has happened, perhaps even to understand the nature of the world, and cheerfully to ascend the funeral pyre with the dead Siegfried, so that the ring may be reclaimed from her ashes by the waters of the Rhine. And as a falcon, or any other bird, after he has roamed about in the air, becomes tired, and folding his wings comes to his resting place, so does that person hasten to that state where, when asleep, he desires no more desires, and dreams no more dreams... But when he fancies that he is, as it were, divine, or that he is, as it were, a king, or "I am this whole universe", that is his highest state of being. [Brihadâranyaka Upanishad, IV.3, verses 18-20.
he events of Parsifal are supposedly set in Arthurian times, so if Kundry witnessed the suffering of Jesus, then she must be over five hundred years old. Not surprisingly, she is tired. She gasps out, Schlaf ... Schlaf ... tiefer Schlaf ... Tod! . She will sleep again and never wake. Like Tristan, she will close the gates of death behind her: hinter mir schon des Todes Tor sich schliessen . But this is denied her; again and again she is conjured out of her sleep by the sorcerer, to become a seductress once more. Like Tristan, she is forced to leave night's darkness. When Klingsor has no more use for her, Kundry escapes to the wilderness where she becomes a penitent. At the end of Parsifal, like Brünnhilde, Kundry closes behind her the open gates of eternal becoming... redeemed from rebirth, the wise one now departs [a passage that was deleted from Götterdämmerung, but printed in the 1872 text as a footnote]. either in the 1865 Prose Draft nor in the 1877 libretto does Wagner explain how long or how often Kundry sleeps. It might be that, like Brünnhilde, she sometimes sleeps for years; it is possible that she has been sleeping for several years of Parsifal's wandering, until she awakes shortly before he arrives at Monsalvat. Finding her, Gurnemanz reveals that he has found her like this before. In the first act he described how Titurel, long ago, had found her asleep in the undergrowth, stiff, lifeless, as if dead . That was before he built Monsalvat. It is as if Kundry knew where it would be, even before it was there. The fact that she awakens in the spring, like an animal coming out of hibernation, might have been inspired by Schopenhauer, who wrote, with reference to hibernation: this is nature's great doctrine of immortality, which tries to make it clear to us that there is no radical difference between sleep and death, but that the one endangers existence just as little as the other . Also: Deep sleep, while it lasts, is in no way different from death, into which it constantly passes, for example in the case of freezing to death, differing only as to the future, namely with regard to the awakening. Death is a sleep in which individuality is forgotten; everything else awakens again, or rather has remained awake. Right: the Parsifal Cross, based on the ideas of Wieland Wagner. Parsifal's progress is shown by the vertical spear, which pierces the plane of Kundry's cycle of rebirth at the point of the kiss. n contrast to Kundry's cyclical existence, during the course of Wagner's drama, Parsifal undergoes a linear development. As in a poem that contributed to Richard Wagner's initial inspiration, Wolfram's epic poem Parzival, the foolish boy becomes a hero, and in both cases the path taken by the future hero is an unconventional one; he follows paths of error and suffering; der Irrnis und der Leiden Pfade . The first significant step on his path is a shock to his system delivered by Kundry; the kiss. 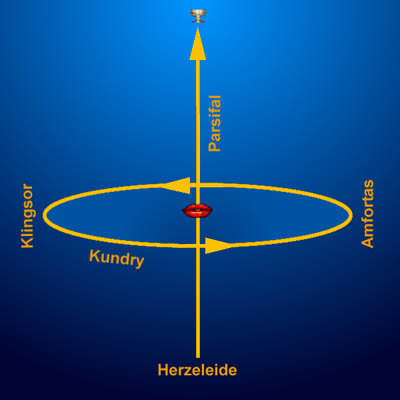 ieland Wagner, the composer's grandson and stage director, once described Kundry as frozen in time, moving in a spatial dimension back and forth between two domains on either side of the mountains; while Parsifal moves and develops in a temporal dimension; these dimensions meet in the kiss. Like the sleeping valkyrie, Parsifal is awakened with a kiss; in the third act, he takes away Kundry's sins (when considered from a Christian viewpoint) or transfers merit to her (when considered from a Buddhist viewpoint) when he returns the kiss. rom a Buddhist perspective, that intense reaction which Kundry's kiss had elicited from Parsifal, is none other than a flash of enlightenment, a small awakening, the first of many which must be experienced on the path to becoming a spiritual teacher, an advanced Bodhisattva. This experience pushed Parsifal's spiritual realisations several notches up, despite the fact that kisses are conventionally regarded as physical indulgences of the sensually-inclined and the worldly¹. Parsifal's progress is still far from complete at the end of the second act, as he shows by his failure to understand Kundry's situation, which reveals that he has not yet reached enlightenment. o discussion of sleep in Wagner's dramas would be complete without considering his interest in dreams. That dreams were important to him is revealed by the fact that many of his dreams were recorded by Cosima in her diaries. Already in his romantic opera Lohengrin Wagner showed us a young woman who withdrew into a world of dreams, in which she saw the knight who would be her champion in the real world. In the Ring he showed us an earth-goddess who sleeps and dreams: My sleep is dreaming, my dreaming brooding, my brooding the exercise of knowledge . Then Wagner discovered the philosophy of Schopenhauer, who described human life too as no more than an ephemeral dream. Inspired by the new impulses he found in Schopenhauer's metaphysics, Wagner created Tristan und Isolde, a work which might be seen as one long flight from consciousness into the unconscious world, finally sinking, drowning, unconscious - highest desire! . An Ocean it is that is One, without any second; this is the Brahma- world, O king... This is man's highest goal, this is his highest success, this is his highest world, this is his highest bliss. All creatures live on a small portion of that bliss. [Brihadâranyaka Upanishad, IV.3, verse 32.
t was in sleep, or in a state between sleep and waking, that Wagner received some of his own inspiration. At least if we take seriously his story of the inspiration for the prelude to Das Rheingold, half- awake on a couch in a hotel at La Spezia and suffering from the after-effects of overindulgence in Italian ice-cream. So in Die Meistersinger we are not surprised when Walther reveals the inspiration that had come to him asleep, which he expresses in his Morning Dream- Song2. undry's sleep is unique however. It is a metaphor within the metaphor that is Kundry. As noted above, Schopenhauer held the view that sleep is in essence and in his metaphysical view, not much different from death: life may certainly be regarded as a dream and death as an awakening . In his metaphysics, sleep (and especially deep sleep, as in hibernation) is a state in which the brain is cut off from the external excitation through the senses as well as from the internal through ideas , allowing the sentient being to escape from the daylight of representation into the darkness and silence of the realm of night, the world as will. Tristan finds this dream-world in the unconsciousness from which we see him reluctantly awake in the third act of Tristan. Kundry finds it in her death-like sleep; she crawls into the undergrowth of the forest to hibernate, reluctantly waking in the spring (as Schopenhauer remarked, from such sleep we awake with a scream ). Her hibernation is not quite like that of an animal however; it is more like the winter survival of insects, described by Schopenhauer, who lay their eggs in autumn and then die. For him, the creatures who emerge from those eggs in the spring are a continuation of the same life that deposited the eggs3. These are simply different strategies for surviving winter. When Kundry awakes, reborn in a new shape, her consciousness is a tabula rasa. At first she does not remember her previous existences, although, as she reveals in the second act of Parsifal, memories of those existences do sometimes return to her, perhaps in waking dreams. Footnote 1: Although it is unlikely that Wagner knew about it, there is a precedent for Kundry's kiss in one of the Maháyána Buddhist scriptures. It can be found in the Gandavyuha Sutra, the last part of the compilation known as the Avatamsaka Sutra, which became known in China as the Flower Garland Sutra. The Gandavyuha Sutra describes the progress of its hero, Sudhana, on the path of enlightenment. On that path he meets more than fifty spiritual teachers, each of whom helps him to find the path. Remarkably, one of these spiritual teachers is Vasumitra, who is both a prostiture and an advanced Bodhisattva. For some beings in need of salvation, the best way to receive the teachings of the Buddha, according to Vasumitra, is in the embrace of a prostitute. Vasumitra's kiss brings a small awakening and so she can be seen as a precedent for Kundry. Footnote 2: Schopenhauer distinguished between two kinds of sleep: deep sleep (either dreaming or non-dreaming), and the "morning dream", which represents a translation of the deep dream into the terms of the waking world and hence, a falsification. In Die Meistersinger, Wagner treats the morning dream in terms of its value for artistic creativity, as he had himself experienced it. In Tristan und Isolde the goal of dreaming is denial of the world --­ eternal night and forgetfulness -- not awakening to the world of day. Footnote 3: This is Schopenhauer's doctrine of reincarnation or metempsychosis. It appears that only late in life did the philosopher realise that reincarnation was an inevitable consequence of some aspects of his philosophy but he never fully developed his doctrine, which as it stands is based on Greek philosophy. He was interested in Hindu and Buddhist ideas of rebirth but even in the third edition of his WWR there is no clear separation between the respectively Hindu and Buddhist concepts. Between the second and third editions he had read books and articles about eastern religions (and provided a reading list on this subject in his Über den Willen in der Natur), which is reflected in passages in the third edition of WWR.